Ahhh, the first weekend of autumn is upon us. The leaves are starting to change, but the air doesn’t have that fall chill to it quite yet. This weekend has summer temps in the forecast–almost 80 degrees tomorrow! In my opinion, that’s just a bit too warm for this time of year in MN. Give me some nice low- to mid-seventies, and I’m good. Since we haven’t had any really cold nights, the tomatoes are still hanging on. 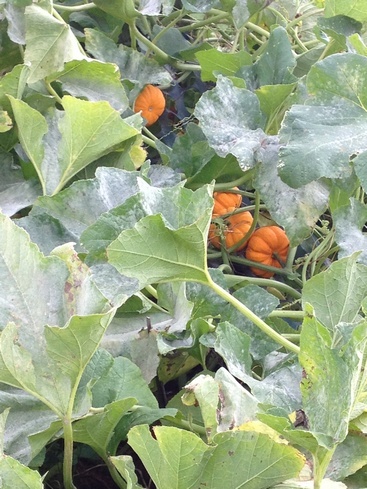 The frustrating thing this time of year is the speed of ripening. The cooler it is, the slower they ripen. And I blew it on tying them up this year; last year I did a good job, and had few tomatoes to show for it. This year’s been great for everything in the garden, but a lack of some micronutrients (note to self: need to add manure to garden after everything’s done) made the tomato branches grow pretzel-twisty, making it that much tougher to support them. Sigh. The onions can be pulled any time. We’re leaving them in the ground so we don’t have to store them yet. We’ll have to pull them before it freezes, but since we don’t have a cool-enough basement or root cellar, the onions start to deteriorate by Jan/Feb. So, the longer they can stay in the ground, the better. 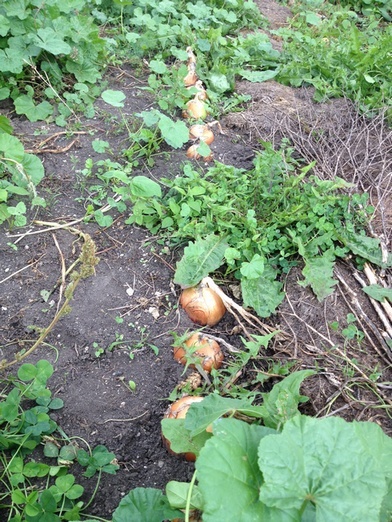 To give you an idea of the size of our wonderful onions, think softballs. The potatoes are also biding their time in the ground for now. They also have a tendency to start sprouting around February in the basement. We still haven’t perfected storing them in a dark enough place that’s cool enough to suit them. There’s also the problem of storing them in something breathable, yet sturdy. We looked at finding burlap sacks, but have you seen the prices of used burlap potato sacks? And there’s the other problem of storing them in the dark. We’re working on it, but for now, they can just snuggle into the garden. This year I didn’t bother with the nice, big bell peppers, like California Wonder. 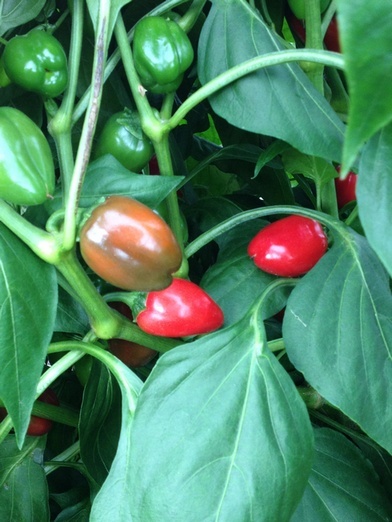 Our growing/warm season is too short for the peppers to ripen to a nice red. Wait, you didn’t know that green peppers are just unripe peppers? Yep, they are. They change color when they’re truly ripe. Well, except for the purple ones; they seem to be purple all the time. Besides, the kids don’t eat peppers, so we always seem to have a surplus, and no version of stuffed peppers or fajitas seems to entice the kids to eat them. So, I found a variety that bears small peppers, like the bright ones you find in the grocery store in those nice cellophane bags. 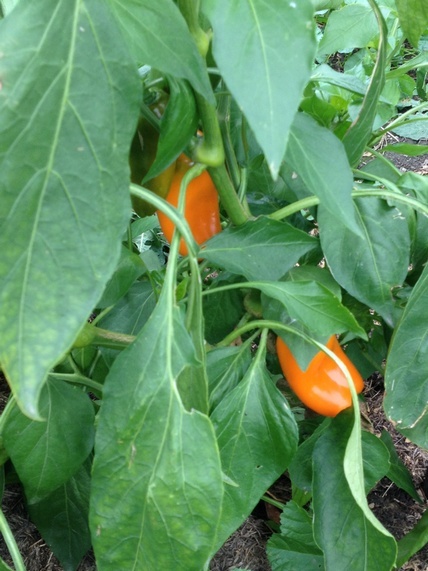 The plants bear like jalapenos do (lots and lots of peppers), and they ripen nicely. I’m getting red ones, orange ones, and yellow ones (I must’ve gotten a variety pack). And they’re so nice and sweet when they’re ripe–love to snack on these. On the harvest havoc side, however, I’m getting more peppers than I can eat. Plus, I’ve got two jalapeno pepper plants (you know, for salsa and chili). So, I did something I haven’t done for over a decade: pickled them. Talk about fun, colorful jars of peppers! 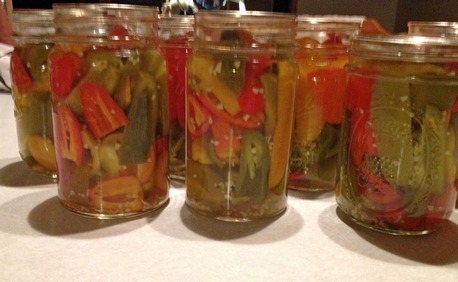 I used mostly the colored sweet peppers, but I tossed a couple jalapenos in each jar. Hope they don’t get too spicy! We’ve still got beets in the garden, and I know I took some pics of the kale, but I can’t find those. Oh, I did try to make kale chips last weekend. Well, they’re different. I’ll have to experiment a bit to get them refined. Next on the menu: vegetarian chili with a bit of kale tossed in for fun. My daughter’s been asking for vegetarian chili for weeks! It’s supposed to be warm this weekend, though, so maybe soup instead. 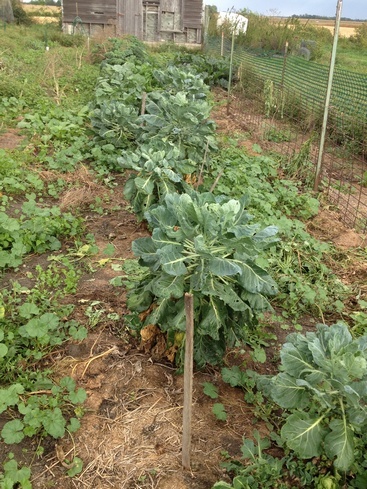 The Brussels sprouts are looking nice, not too badly beaten up by the cabbage worms. I pick those stupid little green caterpillars by hand, and curse at the little white butterflies that flit around and lay eggs on the plants when I’m not looking. Of course, those are the bugs the chickens don’t like. Fickle birds! The sprouts are nice and big this year; I didn’t get any sprouts last year. Last year was a lousy year for a lot of things. My sister-in-law asked me to plant a few things for her, and since I have such a huge garden (note to self: smaller garden next year, and I mean it this time), I planted some rutabaga, parsnips, and mini-pumpkins for her (technically, these are gourds). I planted two mini-pumpkin plants, and they’ve proceeded to conquer the entire southwest corner of the garden. I hope she has enough room for all those little gourds! 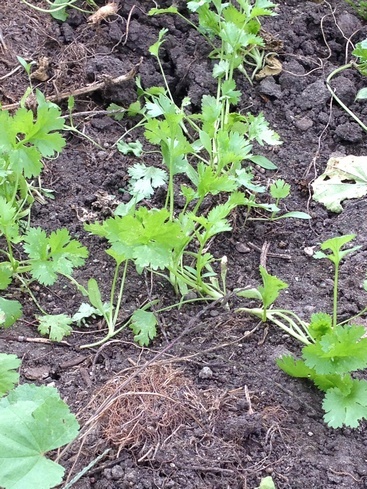 The parsnips and rutabaga will be better after the first frost, so those are just growing happily without a care in the world. The borage, cilantro, and dill reseed like weeds, so I’ve got some borage flowering now for the bees, and my cilantro is almost big enough to harvest again for pico de gallo. The raspberries are starting to bear. Normally, we get a crop in early summer, and one in fall if it doesn’t get cold too soon. This year, no raspberries this summer, but now there are a ton of green berries on the canes. These are the cultivated red ones, not the wild black ones I picked this summer. Still, raspberries = yummy, even if you have to dodge yellow jackets and mosquitoes to get to them. 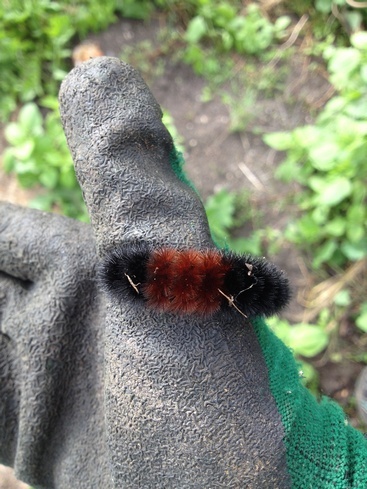 And just a final woolly bear to finish things off. I had to take a pic of this guy–biggest woolly bear caterpillar I’ve seen in a long time. One year we kept one in a jar, fed it, and watched the cocooning. I knew they were moth caterpillars, but never what kind of moth. It came out of the cocoon as a tiger moth. This weekend is earmarked for more tomato-canning, more pepper-snacking, some pico de gallo-making, and fall cleaning. Ugh. I figure, if I can hit the fall cleaning chores hard this weekend, I can focus on my WIP without too much guilt for neglecting my real-life duties. I hope you enjoyed this jaunt through the garden. It’s been raining the past couple days, so I’ve been chipping away at my WIP. I should have the revised “outline” finished by tonight, so I can go into my canning/cleaning tear this weekend without too much guilt. Do you ever feel guilty for neglecting your WIP–wait, strike that. Rhetorical question, I know. Have a great weekend, everyone! Write on! Categories: gardening, Inspiration | Tags: gardening, Inspiration, seasons | Permalink. I’m not a sports person per se, though I do enjoy a good Vikings game (and you’re right, it’s been quite a while since then 😉 ), but now’s the time of year when the summer sports are heading into playoff territory, and the fall sports are trying to get an idea of how this year’s season will go. So, it seemed oddly appropriate to have some sort of a tie-in (Actually, I was trying to come up with a clever title.). School started this week, so it’s back to the routine of school, sports, homework, and the morass of “sign this, pay that, I need this” duties that go with it. Real Life gets points. 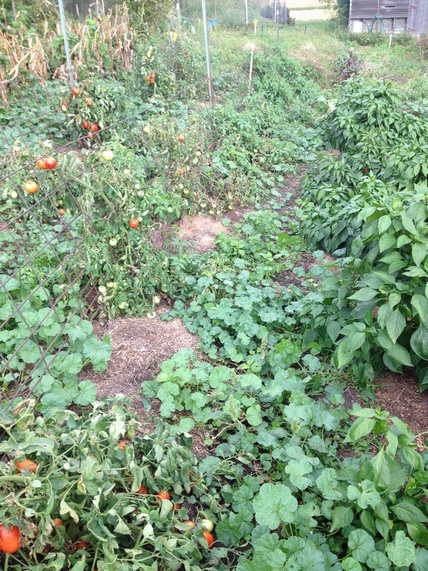 The garden is winding down (point for me! ), but all those tomatoes still need to be canned (points for RL), the potatoes need to be dug out and onions pulled (points for RL), and the green beans and peppers are still growing (points for RL). Oh, and don’t forget those household chores. I think I’ve put them off long enough. I went to pet our fuzzy cat, only to discover it was a monster dust bunny. Seems it’s about time to do some cleaning (lots of points for RL). On the bright side, I did get some writing things done the past couple months, including my super-awesome reunion retreat with my even super-awesomer (yep, made that one up–point for me!) writing sisters, and my foray into Pitch Wars (point for me!). Even though I didn’t get a mentor, I did get very encouraging emails from a couple of the mentors I subbed to. Revising the outline for my WIP–eh, not so much. I’m in the “I kinda know how I want to change things, but I’m not sure I know how to get there” stage. “How was your day at the Fair?” Off-topic. Point for me! “Excuses.” He slides off his perch. “That’s all I’m hearing. You need an agenda.” He pulls a white board from–did he borrow that carpet bag from Mary Poppins? He reaches into the bag again, pulls out an easel, and sets it up with the white board facing my writing chair. One more dive into the bag, and he retrieves a fold-away reclining chair he sets up beside the easel. “Um, what the hell?” I ask, even though I’m afraid I know the answer already. His face is kinda red, and those lines on his forehead look like Mr. Potato Head’s angry eyebrows if they were stretched out. I nod. Sheesh. Note to self: Ask Mae Clair if she can send Mr. E by to take my Muse on a pub crawl. In other news, big shout-out to one of my writing sisters, who just signed the contract for her debut novel–Congrats, Blair! Also, pop on over to the Meet Your Main Character website and check out our new postings for September. Our top 5 list this month is about travel. Stop by and say hi! Categories: revision, Writing | Tags: humor, muse, revision | Permalink. It’s September 2, the big reveal day for Pitch Wars is today. Well, more accurately, it was last night. Rumors were flying that the fantabulous Brenda Drake had a few surprises up her sleeve. During a live you-tube/twitter (I’m not sure what’s it’s called, but it was like a live video-chat) broadcast/chat last night with a number of the mentors, Brenda revealed her surprises, one of which was, of course as many had guessed, early reveal of the lucky mentees. And I’m mentor-less, though I did win a drawing for a free 25-page edit–yay! I’m hoping the mentors I submitted to will send me some feedback; wish I could remember all five. I’ll let the confetti settle a bit before I ask if they’ll send me their thoughts. So happy for the writers who did manage to snag a mentor! I wish them all good luck with the next couple months of revision and the agent round. 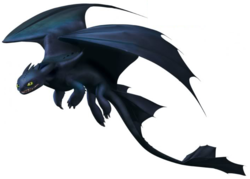 The best part about the Pitch Wars contest is the community. A good number of the potential mentees were active on the #PitchWars feed through the past two weeks, which was fun. I’ve got two possible CPs to work with, and there’s a ready-made pool of other writers who might be willing to do beta reads, etc. All in all, a great experience, and I’m glad I tossed my hat into the ring this year. On the bright side, I can work on my WIP over the next two months and still send out queries for my mss (*Mentees cannot send out any queries until after the agent round). Now, back to querying my mss, and working on my WIP. As the summer ends, the garden wanes, and the kids head back to school, I’ll have more time to write. Well, after the bustle of getting the school year underway is over. Daughter is a sophomore this year, and starting to drive. Son is a senior this year and still doesn’t know where he wants to go to college (sigh), but he’s narrowed his field of study to engineering. Wait! Hmm, maybe I’ll be able to set up a writing room once he leaves. So what’s the next challenge, you say? Aw, that’s easy. My WIP. I won’t be participating in NaNoWriMo this November, per se. I’ve already done my NaNo this year–in February. But, in lieu of the typical fresh NaNo project, I’m planning to hammer on my WIP. My goal: have the mss query-worthy by next spring. I’m trying to hone my voice for romantic mystery/suspense, and refining my process. I rough outline–not scene-by-scene–but I’m trying a few things to see what works for me. I think (and maybe it’s my mentor’s influence here) more planning may help me, since I’m at the point now where instead of writing stories I’ve built in my head over many years, I’m writing stories I haven’t mentally walked through a hundred times. Who are you looking for? *scans the room* Oh, you’re wondering where my Muse is after the machete incident. He said something about research, Lynyrd Skynyrd, and deep-fried cheese curds. I’m guessing he’s headed to the MN State Fair, and didn’t bother to ask me along because, well, I hate crowds. Oh, and it’s gonna be tropical hot the next couple days. Research, though … there’s something to be said about people-watching and fodder for stories. What’s the addage? Be nice to writers, or they’ll put you in their next book. Have a great rest of the week. Stay cool, stay focused, and write on! Categories: NaNoWriMo, revision, Writing | Tags: creativity, muse, Pitch Wars, revision | Permalink.